Cuberoot Technology specialise in consulting and advising you on the best value for money telephone solutions. We investigate every element of your business allowing us to draw up a blueprint for your requirements now and for the future. Are you a small business looking for a low cost, value for money telephone system? 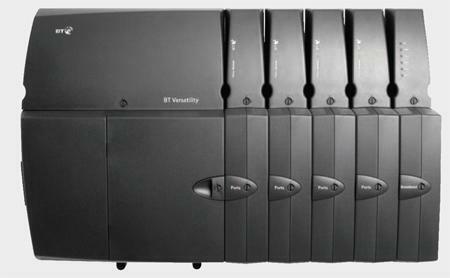 Then look no further than the very popular BT Versatility, it's perfect for small businesses. 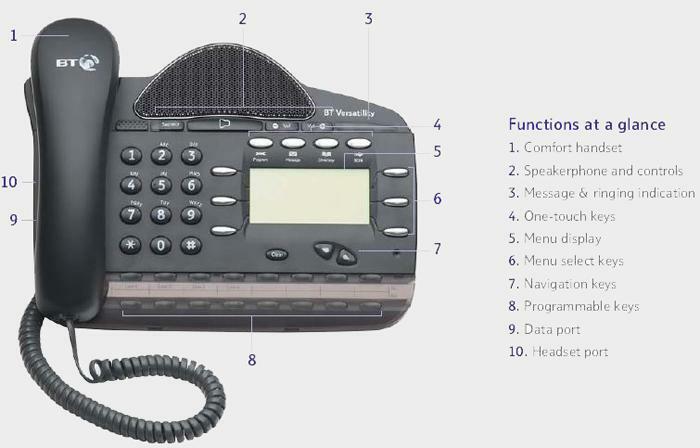 The BT Versatility comes with a great looking range of high function handsets and big company features which can grow as your company grows. Our entry level system offers a refurbished BT Versatility for 2 analogue or digital lines, 8 extensions, 2 port voicemail and 4 handsets and is priced at £650 plus installation and VAT. We also don't believe in contracts that lock you in for a specified period of time. We are so confident of the quality of our products and our high levels of service that you won't want to go anywhere else. Quality V series feature phones are available new and as refurbished units. Telephony Application Programming Interface (TAPI) is a windows based interface that enables computer and telephony integration. When customers ring in, their details can be presented to the customer service representative who picked up the call. No more “I’m just waiting to load your details” as the client details are presented immediately. This reduces the waiting time and delivers superior customer service. There are predominantly two types of entry level systems available for small business in the UK today being PTSN and VoIP. Here we look at the pro's and con's of both systems. PSTN is a network of devices that make up the global circuit switched phone service. It consists of fibre-optic cables, telephone lines, communication satellites and microwave transmitters which are all connected by switches located around the world. It is known as a highly reliable form of communication that is used by millions of people every day. The reliability of the PSTN has increased considerably and today provides businesses with the ability to place calls to anywhere in world in a consistently clear and reliable way. The PSTN uses what is known as circuit switched technology that sets up a dedicated circuit between two callers exclusively for that call and is used only for voice traffic between the two parties. This circuit switch technology provides consistent high quality voice calls. To be linked up to the PSTN users only need a line connected to their business premises. The user plugs their phone directly into into the telephone jack and the connection is instantly made. The PSTN is provided to businesses by the local phone company. Most phone users will already have this service in place. PSTN users don't need Internet service connections to place telephone calls. VoIP is quite simply the process of using the internet to make phone calls. One of the main issues with VoIP is the Quality of Service (QoS) which will determine how your calls will be affected by delays, interference, noise and echo. QoS depends on your broadband connection, your hardware, the service provided by your provider and the destination of your call. This technology tends to be less robust than PSTN as the data (mainly voice) has to be compressed and transmitted, then decompressed and delivered very quickly. If the process is delayed for even milliseconds, due to a slow connection or hardware issues, then the quality of service (QoS) will suffer. Good VoIP depends on a good broadband connection; if your connection goes down, your phone line goes down with it. With VoIP, no Internet equals no phone and if your connection quality is not good, your VoIP experience will also not be good. VoIP is normally deployed over a high-speed broadband connection, which will also be used for other data and communication streams including downloads, server connectivity and email. You will need to ensure that you have adequate bandwidth at all times. As with other Internet technologies, security is also a main concern with VoIP. These issues could affect the integrity of your business if unauthorised 3rd parties are listening into confidential business phone calls or trying to disrupt your regular business processes for competitive advantage.